15 Jan 2019 --- Of the US$1.1 billion spent on advertising to black and Hispanic teens – via Spanish-language and black-targeted TV programming – over 80 percent was channeled to adverts for fast food restaurants and by food and beverage companies marketing unhealthy food. This is according to a report from the Rudd Center for Food Policy & Obesity at the University of Connecticut. The findings indicate that such food companies are spending 8 out of 10 dollars of their advertising budget to junk food, with the adverts being disproportionately aimed at black and Hispanic youth. Black teens saw more than twice as many adverts for unhealthy products compared to white teens in 2017, for example. “This advertising leads to increased preferences and consumption of products with high amounts of sugar, sodium and saturated fat, which contribute to diet-related diseases like obesity, diabetes, and hypertension. These diseases are already more prevalent in Black and Latino communities, so this advertising likely increases health disparities affecting those communities,” Jennifer Harris, Director of Marketing Initiatives, UConn Rudd Center for Food Policy and Obesity, tells NutritionInsight. The study authors are calling on food manufacturers to stop disproportionately targeting Black and Hispanic youth with such adverts. 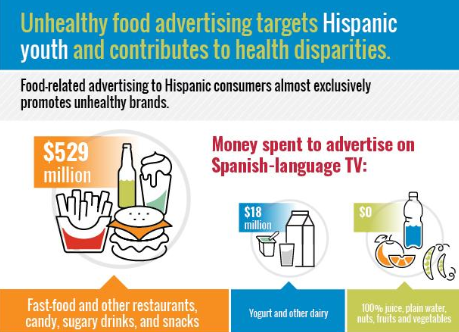 This includes expanding corporate health and wellness commitments to promote the marketing of healthier products to communities of color, and to strengthen Children's Food and Beverage Advertising Initiative (CFBAI) standards to address targeted marketing of unhealthy products to all children and teens, including black and Hispanic youth. Click to EnlargeCredit: Bill Kelly, Kelly Design Company. “Food companies have introduced healthier products and established corporate responsibility programs to support health and wellness among their customers, but this study shows that they continue to spend 8 of 10 TV advertising dollars on fast food, candy, sugary drinks, and unhealthy snacks. Even more advertising for these products is targeted to Black and Hispanic youth,” said Jennifer Harris, Ph.D., the report's lead author and the Rudd Center's director of Marketing Initiatives. Researchers also found that food companies increased their black-targeted TV ad spending by more than 50 percent from 2013 to 2017, even though their total advertising spending on all TV programming declined by 4 percent. The report, “Increasing disparities in unhealthy food advertising targeted to Hispanic and Black youth,” analyzed advertising by 32 major restaurant, food, and beverage companies that spent at least $100 million or more on food advertising to children (aged 2-11) and teens (aged 12-17) in 2017 and/or participated in the CFBAI. The CFBAI is a voluntary, self-regulatory program that sets standards for food advertising directed to children under age 12. 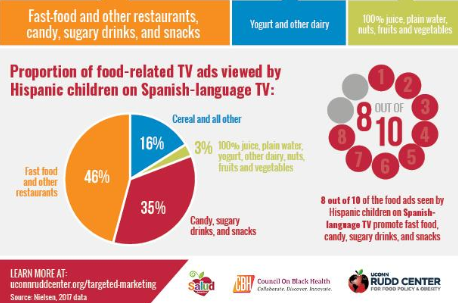 Researchers examined TV advert spending by food companies, as well as young people's exposure to this advertising, and identified brands targeting all children and teens and Hispanic and Black consumers on Spanish-language and black-targeted TV programming. They compared these 2017 findings with data collected in 2013 from an earlier Rudd Center report on this topic. Researchers also examined companies' public statements about their targeted marketing. The report also found that advertising for healthier product categories – including 100 percent juice, water, nuts, and fruit – totaled only $195 million on all TV programming in 2017. This figure represents 3 percent of their overall ad spending. “Companies were even less likely to advertise these products to Black consumers (representing just 1 percent of ad spending on Black-targeted TV), and they were not advertised at all on Spanish-language TV. Click to EnlargeCredit: Bill Kelly, Kelly Design Company. “At best, these advertising patterns imply that food companies view Black consumers as interested in candy, sugary drinks, fast food, and snacks with a lot of salt, fat, or sugar, but not in healthier foods,” says Shiriki Kumanyika, study author and Chair of the Council on Black Health at Drexel University, Dornsife School of Public Health. “Not only are these companies missing out on a marketing opportunity, but they are inadvertently contributing to poor health in Black communities by heavily promoting products linked to an increased risk of obesity, diabetes and high blood pressure,” she adds. “We need to better understand how much exposure they have to these other harder to measure forms of marketing. I think we also need to learn more about the social justice issues around unhealthy food marketing to communities of color and find ways to increase demand for companies to change these harmful marketing practices,” she adds. Companies with the most brands targeted to all youth and to Black and/or Hispanic consumers of all ages included Mars, PepsiCo and Coca-Cola. A recent study investigating the impact of sugary foods in adverts targeting children found that children exposed to television adverts that promote high sugar cereals are more likely to eat the brands of cereals they have seen advertised. The study sought to close this research gap, and concluded that the marketing of nutritionally low foods may contribute to poor quality diets and obesity among children. 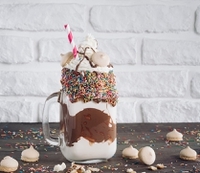 Reducing the marketing of high sugar foods to children may ultimately improve diet quality and reduce the risk of obesity and related chronic diseases among children at the population level, the US study authors concluded.